Handling Time: 30-45 business days approx. 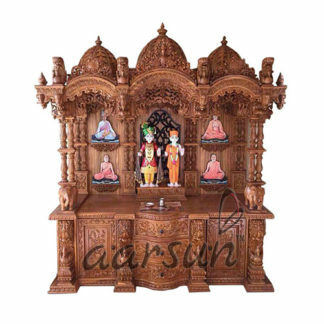 Aarsun Woods Handmade Wooden Temple carefully handcrafted by our skilled artisans. The Wooden Temple play a vital role in everyone life and daily prayer will give us mental peace and strength. This specific Wooden Mandir has 3 major parts. Top: At the top,three domes are placed with fine designs and carving. In front and sides of the dome lies Mehraab with ethnic style floral and peacock carving with designer shikhar. Garbgriha: The Center consists of 4 pillars and Open space in front of the main area along with elephant carving. The back is in plain teak plywood. Base: The base contains drawers for puja essentials. Slider pull out tray is provided for placing Dhoop / Diya adjacent to which are two Cabinets with Beautiful Elephant Heads carved in front. The whole Temple is supported by 4 legs. The unit is in in melamine finish. Lighting Provision is made inside the temple. Please note that the unit is made from teak wood (Sagwan Wood) except for the Base where idols are to be kept, the back, the top as well as the inner portion of the drawers which is made from teak plywood.